Choose your password carefully. It should not contain your first or last name, or anything easy to guess. A password such as "1234" or "password" is extremely insecure. You should choose something including numbers, capital letters and special characters. When you log in on a public computer, make sure you don't select the auto login option. Always select "no" when asked if you want to save your password, and make sure that no one is watching you when you type it in. 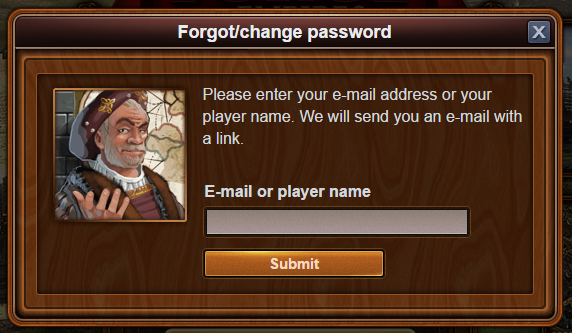 No one from the Forge of Empires team will ever ask you for your password. If you're ever asked to enter your password, it will only be when logging in to the game, so check the address bar in your browser to make sure you're at the real version of Forge of Empires. You should never use the same password for multiple sites. It is especially important not to use the same password that you use on your email address on any other site. If you lose control over your email, you will lose a lot more. If you ever lose your account password, you can recover it via your email. We will not be able to help you if you lose your email account.